Since we opened Exist into public beta we've had a UserVoice forum where our users can suggest and vote for new integrations. Our most popular integration request for the past few months has been RescueTime, sitting on 115 votes. The next request on the list is sitting on 63 votes. 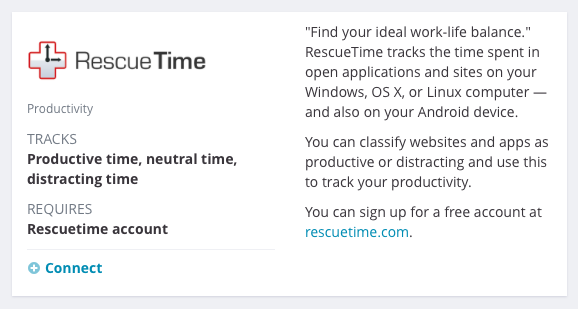 So we're happy to announce that we've integrated RescueTime, and you can now add your productive, distracting, and neutral time to your Exist account. To get started, just login to Exist and go to your Service settings. Find the RescueTime tile and click "Connect". Both Exist and RescueTime are designed to help you understand your life so you can make better decisions and build new habits. Josh and I use RescueTime every day, so we're excited to be able to partner with a team whose goals are so closely aligned with ours. We hope you enjoy keeping track of your time alongside your other Exist data, and can't wait to see what insights and correlations we all find. Exist helps you understand your life. And we just added free 14-day trials!